AK-Asyl Lauf a.d. Pegnitz - "Over 5,000 migrants have died in 2016, compared to 3,777 deaths registered in 2015. That is nearly more than 2,000 more than in 2014." "Over 5,000 migrants have died in 2016, compared to 3,777 deaths registered in 2015. That is nearly more than 2,000 more than in 2014." Switzerland - IOM reports that 358,403 migrants and refugees entered Europe by sea in 2016 through 21 December, arriving mostly in Greece and Italy. Deaths in the Mediterranean this year reached 4,913, according to IOM’s Missing Migrants Project with 13 new fatalities reported since its last report on December 20. Six of those deaths occurred on the route between Turkey and Greece late Tuesday, with another seven corpses reportedly discovered during a high seas rescue on the Libya-Italy route early Thursday. The 4,913 deaths in the Mediterranean through December 21 indicate a 2016 average daily death toll of nearly 14 men, women and children per day. IOM believes many more deaths at sea may have gone unreported this year – in the Mediterranean and elsewhere – particularly between North Africa to Spain, where data collection this year has been sporadic and many smaller vessels are believed to have been lost without detection. 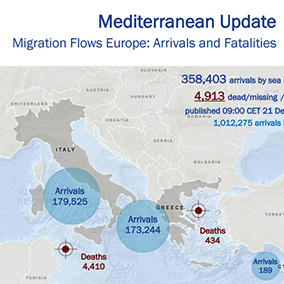 Moreover these data do not reflect new information received by IOM Rome earlier today. IOM has learned that on Thursday night at least two new shipwrecks occurred, resulting in fatalities that – if confirmed – would bring this year’s death toll to over 5,000 men, women and children. According to IOM Rome spokesperson Flavio Di Giacomo, IOM has gathered testimony from survivors of two incidents that caused the death of at least 100 migrants. According to survivors brought yesterday evening to Trapani by the Italian Coast Guard ship Diciotti, the two shipwrecks involved rubber dinghies that capsized while trying to cross the Channel of Sicily. While details of both incidents remain to be investigated, IOM reports Friday that witnesses from a total of 63 survivors traveling in one dinghy indicated that their craft was carrying between 120 and 140 migrants. In the other incident, about 80 migrants reportedly survived from a dinghy said to be carrying about 120 people. Early indications are that mainly Western African migrants were on board both vessels, among them a significant number of women and children. Di Giacomo explained that the number of shipwrecks reflects the poor state of the boats used by the migrants, compounded by harsh weather conditions at sea in this season. IOM Rome also reported Thursday 179,525 migrants arrived in Italy by sea this year, a 19 percent increase compared to the same period last year, and a 7 percent increase over 2014. Arrivals through the first three weeks of this month totalled 6,517, or nearly 2,200 per week – compared with a weekly average for the entire year of nearly 3,600. Since the start of 2014, IOM calculates over half a million sea-borne migrants have entered Europe via the Central Mediterranean route linking North Africa to Italy. This year’s totals almost certainly will top 180,000 – making 2016 the busiest year for this route since the current migration emergency began. IOM Athens reported Thursday 173,244 migrants and refugees arrived in Greece by sea this year through 21 December, bringing the total to 1,061,336 since January 1, 2014.